Ujamaa Collective is embarking on a 7 days guerrilla gardening walk in 7 communities from 27 November to 3 December 2017. We believe that the ongoing self-destructive nature of the township existence is informed by the grinding dehumanising poverty that most people find themselves in. The 7 Days Walk intends to raise awareness about the need for community gardens and to assist community member to start and maintain their own gardens. 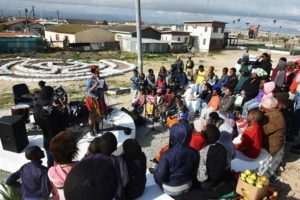 The 7 Day Walk will include Mfuleni, Delft, Bonteheuwel, Langa, Gugulethu, Manenberg, and Mitchells Plain, linking them with our guerrilla gardening program in Khayelitsha. It will start at the Ujamaa Collective amphitheatre and include a gardening workshop at the Ujamaa Collective communal garden. Go to our Videos section or click here to view each day’s video as we upload it. We are very excited about our brand new website. Get to know us, get informed and get involved! The word “Ujamaa” refers to an economic cooperative system which operates with a collective ownership approach to resources. As a community based organisation, it was born from the need to respond to socio-economic challenges. We work towards an alternative, self reliant and communal socio-economic system. Ujamaa Collective is futuristic and idealist in re-imagining a society where there is enough for all, in the absence of racism, class structures, patriarchy and violence. In this future all people live in harmony with everyone and everything, including nature and the elements of water, wind, fire and earth.